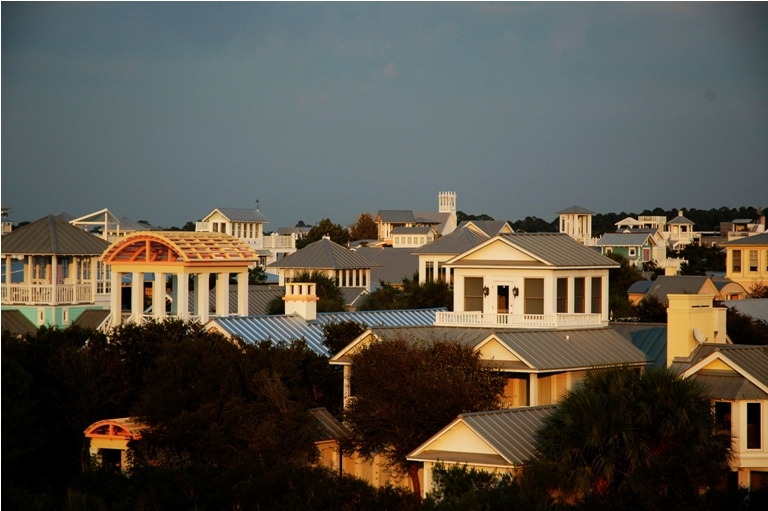 Seaside offers single family homes and home sites, as well as condominiums. Andy and Christina Meinen specializes in the listing, marketing and sale of Seaside FL real estate. Seaside can be held responsible for the refinement of town planning along Scenic Highway 30A on the Gulf of Mexico. Seaside is approximately 16 miles east of Destin and 17 miles west of Panama City Beach in Northwest Florida, very near the middle of the 30A corridor. Seaside is perhaps the most iconic of all the beach communities found on the Emerald Coast for establishing a pedestrian-scale, master-plan model for controlled development. Seaside is characterized in large part by the traditional style of the South. Like its neighbor and sucessor WaterColor, Florida cottage-style homes with clapboard siding and metal roofs line up behind picket fences that run along the shaded path-like streets of Seaside. Tower rooms are not uncommon elements and peek up above roofs for a glimpse or extended view of the Gulf. Greco-Roman elements are also found in many of the Gulf-front homes for sale in Seaside as well as those along the grand Seaside Avenue. Owners and guests in Seaside want for little else than what this beach community offers. Boutique shops, casual dining and seasonal entertainment at the amphitheater complement private beach access, pool areas and tennis courts. The artist colony of Ruskin Place and the stunning Seaside Chapel are popular among visitors. Seaside even has its own Post Office. Each street in Seaside offers its own private and unique beach access point. From west to east the beach pavilions are named after their associated streets; Natchez, Odessa, Pensacola, West Ruskin, Coleman, Seaside, East Ruskin, Savannah and Tupelo.